Previously unknown before MESSENGER’s second flyby on October 6, 2008, the Rembrandt Crater is a young impact basin on the surface of Mercury. It is approximately 430 miles wide…large enough to span the distance from Washington, DC to Boston. Of course, “young” is a relative term here; the basin is estimated to be 3.9 billion years old. 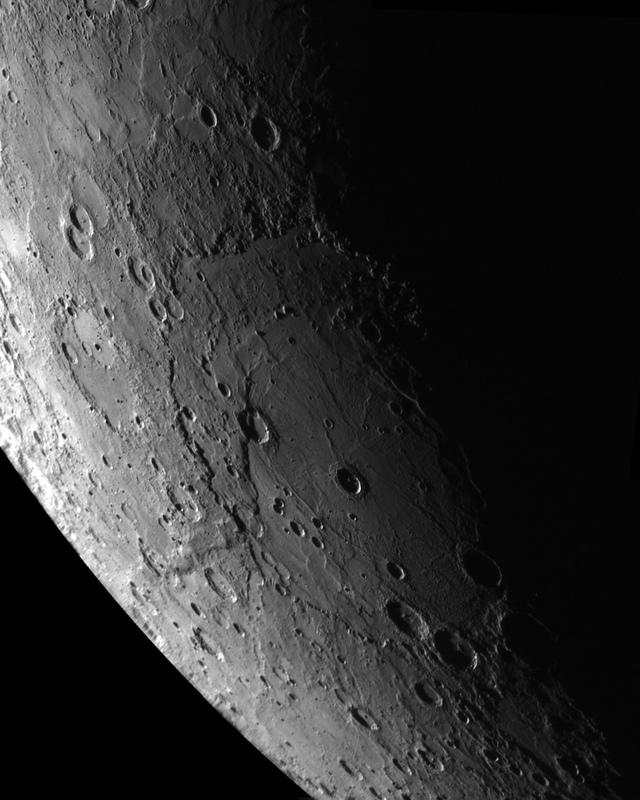 Still, it’s several hundred million years younger than many of the other craters on Mercury. And what makes it of particular interest to scientists is that the features on its floor have been preserved since its creation, and haven’t been covered over by lava flows which is the typical scenario for features like these. This image was chosen as the cover for the May 1 issue of Science magazine. The most recent findings reported by MESSENGER mission scientists can be seen here, revealing Mercury as a much more dynamic and enigmatic planet than was previously expected. MESSENGER will perform one more flyby in September before maneuvering into orbit in March of 2011, becoming the only spacecraft ever to orbit the first planet from the sun. The orbital phase of our mission will be like staging two flybys per day. We’ll be drinking from a fire hose of new data, but at least we’ll never be thirsty. Mercury has been coy in revealing its secrets slowly so far, but in less than two years the innermost planet will become a close friend.